I needed a quick mani before embarking on a city break to Budapest recently. I always like to have something jazzy on my nails when I go away, gets me into the holiday spirit! Emma and I had been having a blogging day, which we spent watching Hunger Games instead of working on our nails, so I needed something speedy but fun, leopard print was a no brainer! 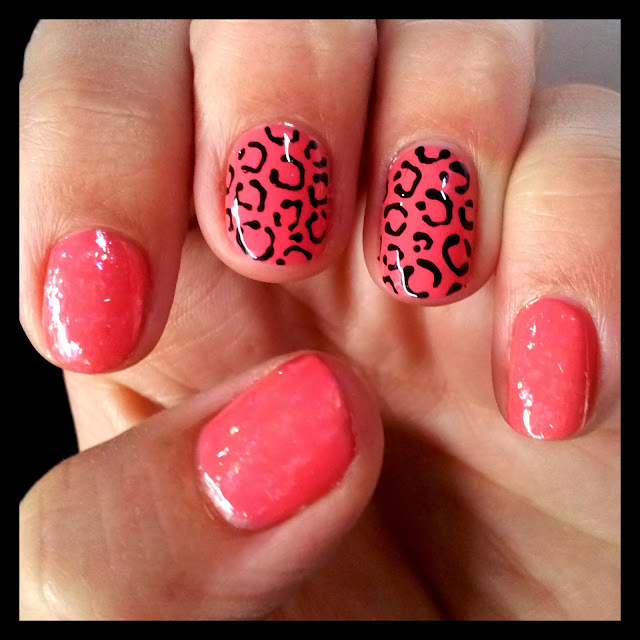 I love leopard nails and they are so quick and easy to do. I chose Rimmel Pro Cocktail Passion as a bright base colour. It's a bold pink tone, verging on coral. The Rimmel Pro formula is lovely, long lasting and their round brushes make it so easy to apply. We won this Rimmel shade in their Nail The London Look - Nails of the Week competition. I used my trusty Models Own nail art pen for the leopard print detailing. To add a little extra sparkle to the mani I added a couple of coats of Barry M's Crystal Glaze, another from our Halloween competition win! This polish was more subtle than I was expecting, but added a lovely shimmer to my nails. I think I'm going to try it over a pale baby pink next for a super girly mani. What do you wear on your nails for holidays?